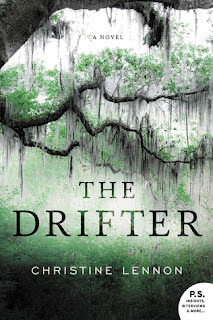 The Drifter by Christine Lennon is a recommended coming-of-age story set in Gainesville, Florida and NYC during the 1990's. Elizabeth (Betsy) is successful, working at a large art auction house in NYC. She and her husband, Gavin, have a four-year-old daughter, Remi. So why is Elizabeth having nightmares and why is she finding it so difficult to let Remi attend preschool? The answers are found 20 years ago, back in 1990 when she was in college. Betsy and her two closest friends, Ginny and Caroline are all attending the University of Florida where they first met as sorority sisters. Now rebellious and independent Betsy has turned in her pin. She and Ginny are still close, but she's had a rift with Caroline so their interaction with each other is, at best, tolerant, but usually tense and prickly. It is August and Betsy and Ginny have spent the summer as roommates. Betsy rides her bike to the bagel shop where she works. She drinks too much and hangs out with Ginny, waiting for Caroline and the students to return and classes to start. Betsy just has one more semester until graduation and she has just met Gavin. When a young woman is brutally murdered in town it doesn't become frightening until there is a second victim and it appears that there is a serial killer on the loose. Lennon opens with Elizabeth in 2010, trying to let her daughter attend preschool, but still fearful for Remi's safety and apparently having nightmares again. Then it jumps back to August 22, 1990, when Elizabeth was Betsy and finishing college. The Drifter has this great opening, a hook to capture the reader's interest - why is Elizabeth so frightened and having nightmares. Then the novel jumps back in time, when she was in college, and you assume answers will be coming. Lennon does capture the college life, sororities, and divulges Betsy's back story. The answer about what happened to Elizabeth in college does come, but it seems almost an afterthought. Then the novel moves on with Betsy and Gavin in NYC where they are trying to start their careers and carelessly doing too many drugs. Betsy is now Elizabeth and she is still haunted about what happened in Florida. The problem is that we read about the traumatic event and then the novel goes on and on about the minutia of Elizabeth's life. Actually, what she needed was a therapist to help her work through what happened. I guess my main problem with The Drifter is that plenty of people have had events just as or more traumatic happen in their lives, but they don't allow it to take over. They also don't tell everyone they meet about it. Lennon does do an excellent job with her descriptions and in setting the time and place for her characters. You can feel the heat and humidity, appreciate the relief a cold blast of AC brings. Betsy is a well-developed character - even while you are shaking your head over her depression and self-induced anxiety. There is a surprise reveal at the end that really is anticlimactic after the years of Elizabeth's angst. Read this one for the descriptive writing rather than the plot. Disclosure: I received an uncorrected proof of this novel from HarperCollins for the TLC book tour.